NEW DELHI — The news last month that Amish Tripathi was offered $1 million to write his next series of books astounded India’s English-language publishing industry. Advances of even $25,000 are rare here, and Tripathi still isn’t sure of the new work’s precise theme. That the deal was struck simply on the success of his 2010 trilogy about Shiva, the Hindu deity, is the starkest measure yet that Indian mythology has become the most marketable segment of India’s English-language book market. The trend started in 2003, with the publication of the first volume of an eight-part series by Ashok Banker on the classical epic Ramayana, which describes the victory of the virtuous King Rama over Ravana, a learned king gone astray. Combining the appeal of fantasy and historical fiction, Indian mythology now reaches from graphic novels to business books. And the genre’s growing popularity is yet another story of how tradition in India has adapted to development, with the attendant gains and losses. For a long time, Indian publishers didn’t consider Indian mythology to be promising material: Those tales were as widely known in India as those from the Gospel in the Christian world. In the central part of the country, where I grew up, they were passed on orally from parents to children or, during festivals, through the entire community at once. In much of the region, Ram Lila, an annual 10-day stage performance of the Ramayana, was acted out by the locals, mostly amateurs. 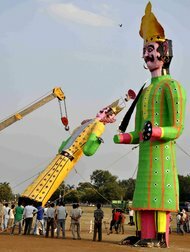 On Dussehra, the festival’s last day, we would all gather around for the burning of the ten-headed, hundred-armed effigy of Ravana. With increasing urbanization, this tradition began to break down; people lost ties to their ancestral villages, and oral transmission wasn’t suited to city life. Given the country’s religious diversity, the government-prescribed school curriculum steered clear of any teaching that could be associated with a particular religious community. This left a gap, which the current surge of mythological fiction is trying to fill. Banker’s “The Prince of Ayodhya” — which is better written than many books in the genre that have followed — introduced the Ramayana to a new generation of readers. It is well paced, and, much like Tripathi’s new book about Shiva, it breathes humanity into characters that most Indians consider to be deities. This brings freshness to the old stories and makes their intricate, discursive narratives more accessible to an audience that has been bred on the linear plots of Hollywood and Bollywood movies.